The number of brick-and-mortar stores has significantly decreased - despite the fact that high street also benefits from the current sales increase. According to Statistics Netherlands (CBS), turnover in the Dutch non-food retail sector grew 3.1% in 2017. Do-it-yourself items, kitchens and floor turnover grew 7.5%, while furniture and household stores recorded 4.5% turnover growth, all reflecting a robust housing market. On the other hand, turnover of consumer electronics stores declined 2.1%. 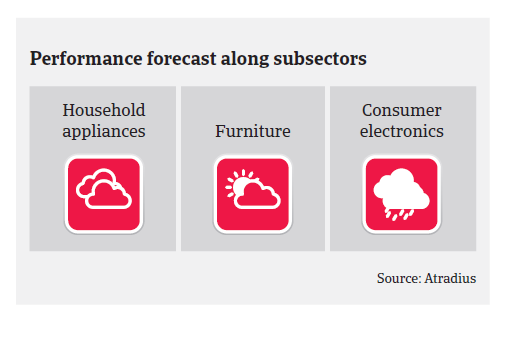 In 2018 consumer electronics performance is expected to remain feeble, while revenues in the living/home-related segment are expected to increase by about 4%, thanks to the strong housing market and robust consumer confidence. After a slight increase in 2017, businesses´ profit margins are expected to level off only in 2018, mainly as a consequence of tougher competition. This competition is mainly driven by the extraordinarily high growth rates of the online retail segment – at the expense of offline sellers (in 2017 the volume of online sales rose 19.5%), and this trend is set to continue. The number of brick-and-mortar stores has significantly decreased in recent years - despite the fact that high street also benefits from the current sales increase. Various retail chains have shifted their focus to online sales. 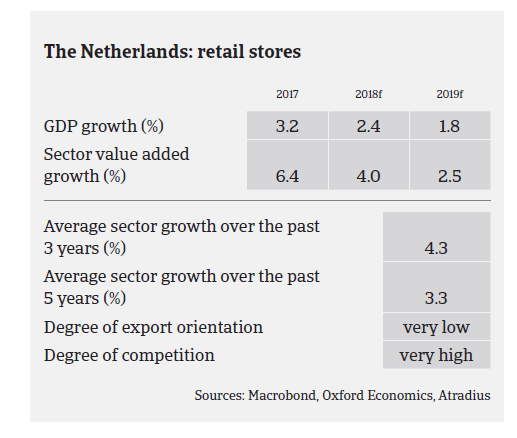 At the same time, we see a significant number of new foreign retail chains entering the Dutch market, especially in fashion retail, but also in the DIY and kitchen segments. Competition is especially fierce in the largely saturated consumer electronics market, where bottom prices have been reached in various categories and the number of retail chains has decreased significantly over the last 10 years. Despite generally decreasing sales, the top three online players managed to achieve such strong growth rates over the past couple of years that they pose a serious threat to the (remaining, but ailing) established chains. Large foreign platforms such as Amazon and Alibaba are increasingly paying attention to the Dutch market, which will result in even more pressure on prices and the margins of established players. Payments in the Dutch non-food retail sector take 60 days on average, and while non-payments have decreased in 2017, they are only expected to level off in 2018. 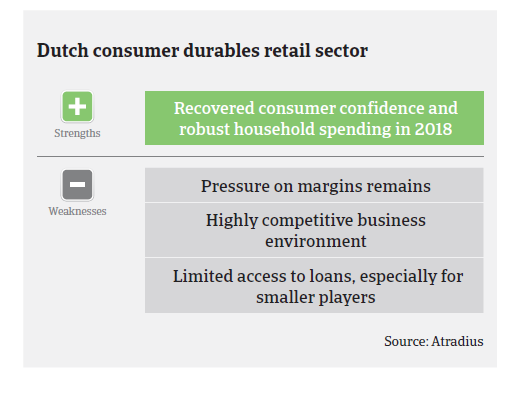 Non-food retail insolvencies are expected to decrease further in 2018 (by about 2%-4%), after a decline in 2017. However, this remains a high level when compared to other trade sectors. 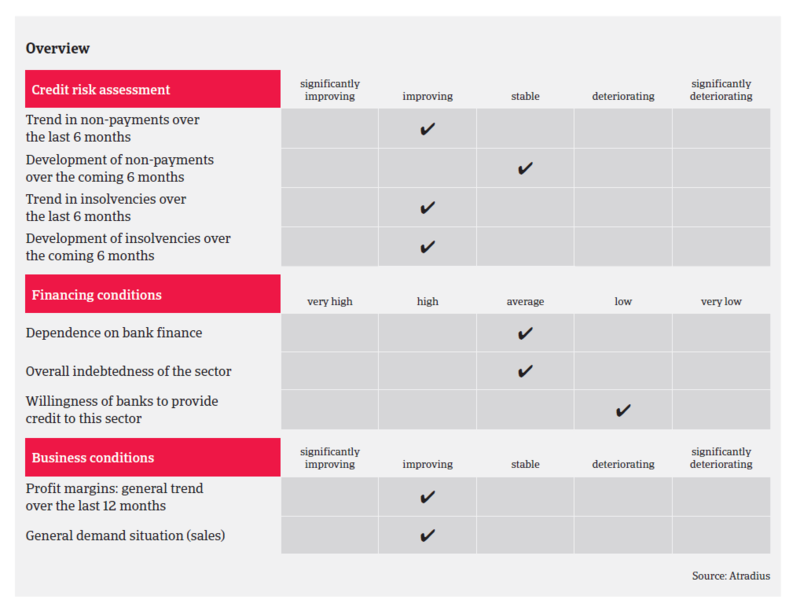 Our underwriting approach for the industry remains generally cautious despite the sales upswing, given the current and future challenges for the industry, especially regarding the major shift towards online sales. While being more open in the furniture segment, we remain restrictive in the consumer electronics subsector.